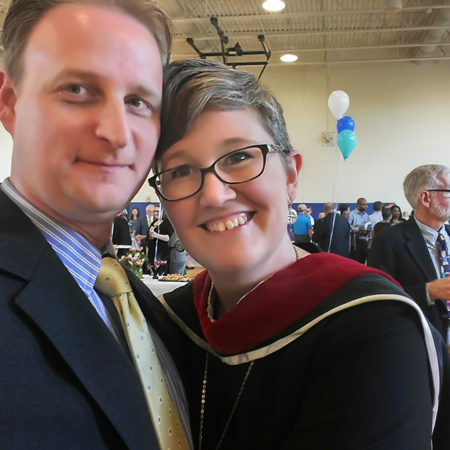 On May 14, 2017, Chrissy graduated from Louisville Presbyterian Theological Seminary (LPTS) with a Masters of Divinity degree, a Master of Arts in Religion, and a certificate in Educational Ministry. She is the recipient of the Norma Rich Merit Scholarship, The Burton Z. Cooper Prize in Constructive Theology, The Melanie Lane Preaching Award, The Bernice Bean and Gladys Kendall Prize for Academic Excellence, and The Fielding Lewis Walker Award in Doctrinal and Historical Theology. Before entering seminary, she served as Director of Christian Education at Chapel Lane Presbyterian Church in Midland, MI. Chrissy is a high-energy extrovert who loves preaching and teaching. 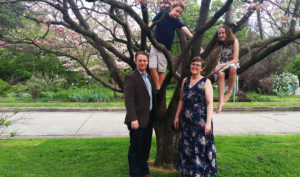 Her family includes her husband and partner, Dirk Westbury, and their two children, Daphne (13) and Ryan (9), as well as their dog, Bauer, and their cat, Calvin (a seminary stray who “providentially” wandered their way one January). Chrissy has been an active member of the LPTS community, serving on the Seminary Council as a student representative, singing in the seminary choir, heading the Agape Theatre group, serving as a teaching assistant, and a Student Chapel Coordinator. Outside of school, she loves theatre, books, anything “crafty” and creative, and baking. The Associate Pastor Nominating Committee was elected in November, 2016, and began work in December. Session approved a revised position description of the Associate Pastor in January, creating a full-time position, which included Rob Bradford’s responsibilities. If you would like to see the position description, a copy may be obtained from the church office or from the website. The first task was to revise the position description and complete a Ministry Information Form (MIF). The MIF provided comprehensive information about our congregation and community to prospective candidates. This task was expedited by the The Search Process recent visioning process. Once the MIF was completed, it was uploaded to a computermatching referral system. Some prospective candidates emerged as possible matches. The committee also received dossiers though self-referrals. Over 100 Personal Information Forms (PIFs) were received by the committee. The search process included a review of every PIF, a selection of short telephone interviews, a number of Skype interviews, and an inperson interview weekend. A representative from the Presbytery assisted the APNC throughout the process.